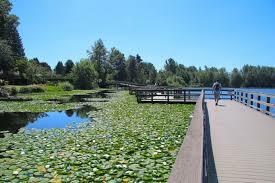 Mill Lake is the obvious first choice for a leisure afternoon or evening stroll in Abbotsford. Equipped with several playgrounds for the kids, quiet picnic areas, spray parks, and outdoor pool (in summer) it is a perfect place for the whole family! The park is popular spot for joggers and walkers – the lap is 2.3 kms long and winds through shaded and sunny areas around Mill Lake. Enjoy fishing (stocked in spring and fall), floating boardwalks, and countless benches with lake-side views. 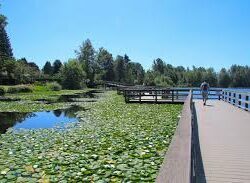 While driving to Mission along the Abbotsford Mission Highway take a look right, you will spot several walking bridges and a few ponds. Willband Creek Park is made up of 2 loops that connect to each other – the northern loop measures 1.6 kms and southern loops is 2.3 kms long. 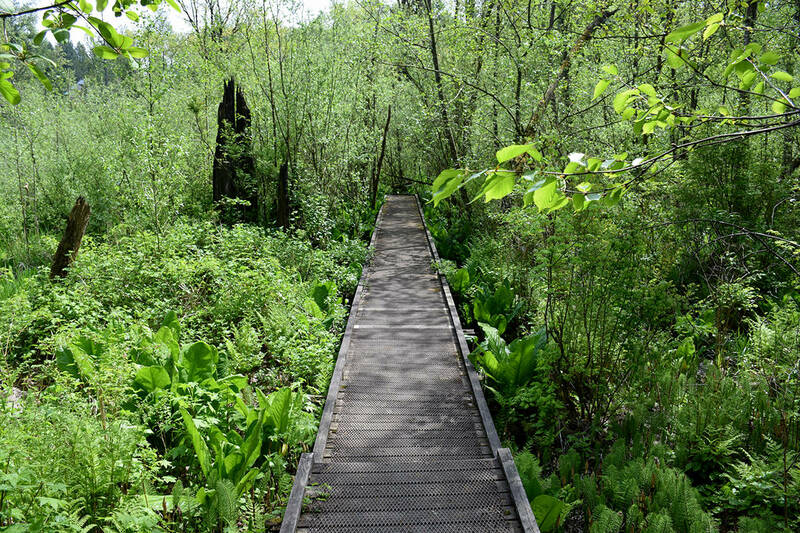 The trail is easy going with several sightseeing benches and wooden bridges. The activities enjoyed in the park include walking, jogging, biking, birdwatching and picnicking. In the mood for a large and open green space? 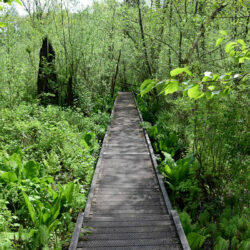 Clearbrook Park is a 5.5 kms long loop and is connected to the Discovery trail. Throughout the parkland there are sitting benches, day use picnic tables, shelter rest areas, baseball diamonds, soccer field, and more! If you are up for a little bit more of a challenge venture down into the Downes Bowl. You will find a network of trails that will lead you into nature in the middle of the city – this is a must-see for sure! This is another great park that is connected to the 30+ km discovery trail! The loop is 3.5 kms long, winding around the wetlands and creek. It is well treed and completely paved – perfect for strollers and wheelchairs. On your way around you will see many walker, joggers, and the occasional cyclist. There are many benches for a break and a view, softball fields, picnic shelter, and lookout viewpoints. If you are looking for a walk with a canopy of green and peaceful waters this is the place for you!